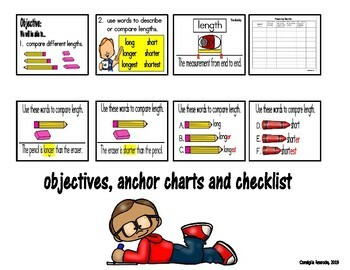 K.MD 1-Describe measurable attributes of objects, such as length or weight. 1. 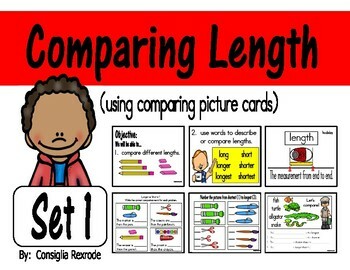 MD 1-Order three objects by length; compare the lengths of two objects indirectly by using a third object. 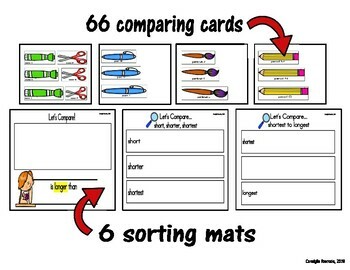 Your students will enjoy comparing the lengths of different objects using the comparing cards and sorting mats along with the various activity cards that provide critical thinking. Use the resources in centers, independent work or make copies of the activity cards for additional homework. Please stay tuned for Set 2 (Measuring Lenght using tiles, clips and craftsticks). Hope you and your students enjoy this product. Your comments, suggestions, feedback are always appreciated.